> Do you count Maxwell SMM as single core? > with what we consider "a core" in traditional or semi-traditional (Bulldozer) CPUs. Yes, an SMM is a single core. And I count it as a single core because Nvidia considers it a single core. If they thought it was a 4 core cluster than they would of either renamed it or made each sub-block a different SMM. The Maxwell SMM basically goes from having a global scheduler to having 4 sub schedulers with dedicated resources. That doesn't mean they are 4 cores unless you want to consider most current cpu cores as containing multiple cores. > What is your threshold? Mine is 50.
at 22/14nm? >100 and a hardware programming model dependent on function shipping. You know, the whole thing that manycore was founded on. The whole idea of having a line between manycore and multicore based solely on core count is basically bunk. 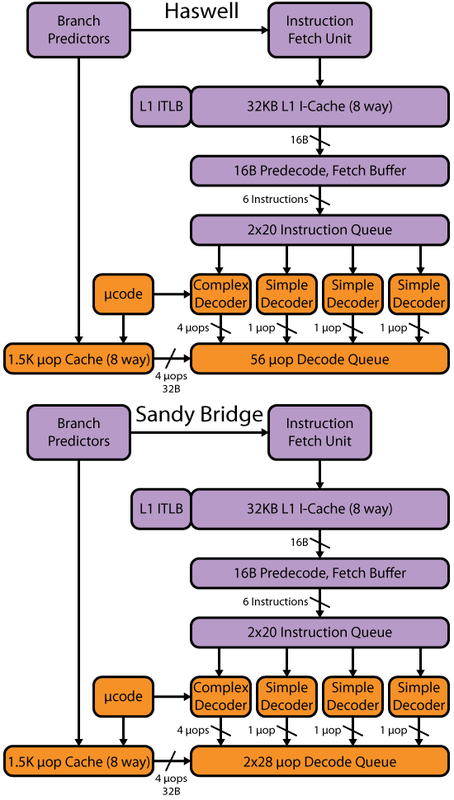 Manycore has several actual structural hardware requirements beyond just lots of cores. > The integer part is most likely OoO, but I am not expecting VPU ALUs to be OoO. > issued ahead of preceding VPU ALU and VPU store operations and if yes then to which degree. I would bet money that whatever the FPU on silvermont does is what the VPU on the KNL will do.